Welcome to SCUBA News number 201. Thanks very much for subscribing. I hope you find the newsletter useful - you can download a pdf version of the newsletter here. ► Which Sunscreens are Safe for Sea Life? 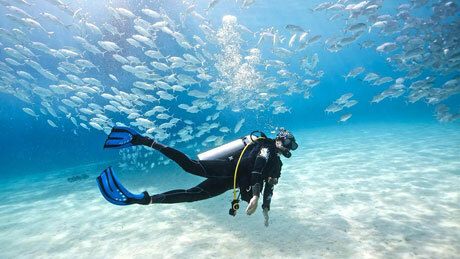 Home to the marine biodiversity hot spot of Cabo Pulmo, Baja California has world class diving. Discover the marine world of Greece. Where are the best dive sites and centres? I'm starting to plan a 25 day trip to Egypt. 7 to 10 day liveaboard and send my gear home and then go to the markets, museums, and pyramids. As I said I'm just starting the planning today so any help or suggestions are appreciated. Normally I'll stay at a place with simple accommodations bed, shower, TV, Internet, aircon and then dive at the resort. I am thinking about taking my ssi master diver course if it's available. Any recommendations for the first week of April? I've got 120+ dives logged, my girlfriend has about 30. Based in UK. I really enjoy your very informative guide for the diver and traveler such as myself. Im actually emailing in hopes that you can assist me with something. I am working on a guide for divers, new and old, and im trying to gather as much information as possible. Your website is perfect for destinations and is so informative and helpful, but I wish to gather my own information with your help. In Reply to previous Letter on easy, good, warm diving within reach of Vancouver. Try Baja, wonderful fish populations. I love St Croix, great conditions, easy diving and the best pier in the world! I can dive 90 minutes on a single tank at 20 ft. Shore diving is simple there and is much cheaper than boat diving. Key Largo, also easy diving in terms of depth and conditions. Just don't go in August, jellyfish! I recently became a dive professional at the age of 55 and am now working in St. Croix. I love helping people find the perfect places to dive! Your site is really a wealth of info and I will share it often. I am presently in Barbados, diving the wrecks and reefs, doing a preliminary assessment of the island as a location for a coral reef restoration course and a marine archaeology certification. Can you help any of our letter writers who asked questions? Contact news@scubatravel.co.uk. 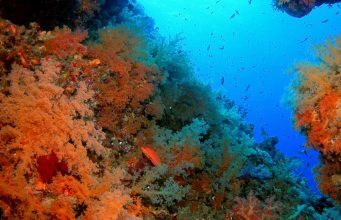 Another study, this time by Roberto Danovaro, named butylparaben, octinoxate and 4-methylbenzylidene camphor as being harmful to reefs. According to NOAA (National Oceanic and Atmospheric Administration) 4,000 to 6,000 tons of sunscreen enters reef areas annually. This does not spread out rapidly or evenly over the entire ocean, but concentrates on popular tourist sites. It is estimated that 90% of snorkellers and scuba divers are concentrated on 10% of the world’s reefs. Which sunscreens are safe for sea life?. SCUBA News 2017. 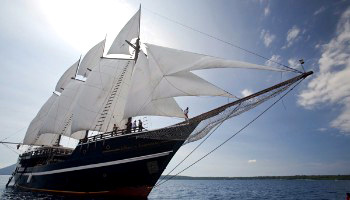 Dive Indonesia on the beautiful Dewi Nusantara liveaboard in June or July and your buddy goes free! Visit the amazing, world class dive sites of Alor. Brittle Stars that Steal Food From Jellyfish! They are what's called kleptoparasites. In other words, they take food directly away from the jellyfish out of the mouth or the oral arms, stealing or scavenging food from the jellyfish which are known as big pelagic predators. The Marshall Islands in the Pacific Ocean became the first nation on Tuesday to ratify a 2016 accord to cut the use of powerful factory-made greenhouse gases, saying the survival of the nation was at risk from climate change. Sea surface temperatures are so high across much of the tropics that many reefs will suffer severe bleaching for an unprecedented fourth year in a row. Divers in Australia are already reporting new bleaching in the northern part of the Great Barrier Reef, where last year half of corals in the worst-hit areas died.